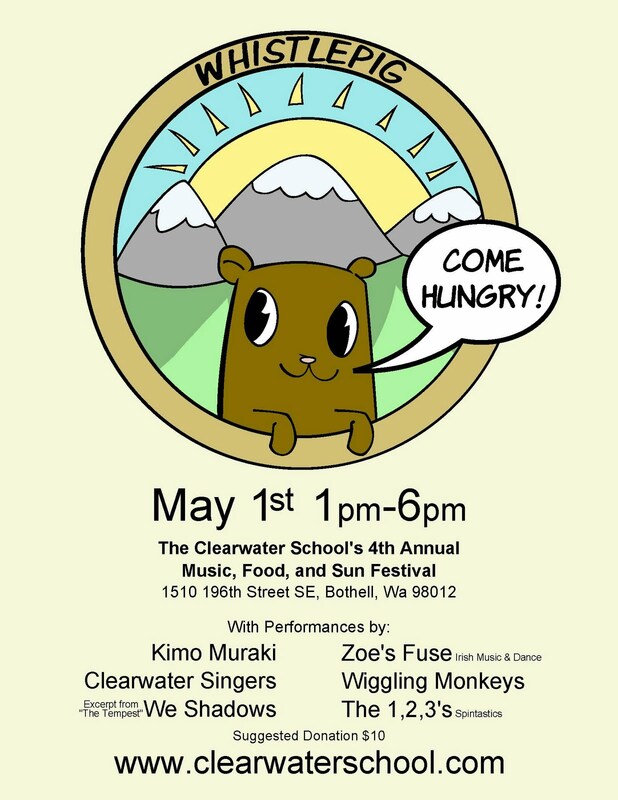 Many Clearwater students and all four staff members are spending the week in a state of high expectation and preparation for Whistlepig, Clearwater's fourth annual festival of music, food and sun, this Sunday, May 1, 1-6pm. (We hope the sun cooperates and shows its welcome face on Sunday.) 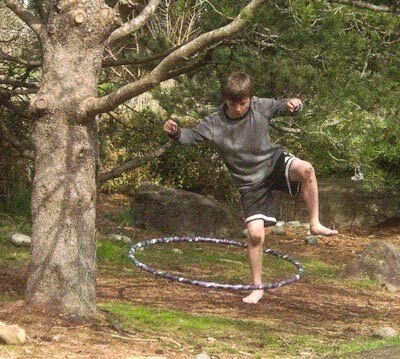 Details of all the great things you can see and do at Whistlepig are at the end of this post. First, here's a sneak peek at two of the performances that will be featured at Whistlepig. 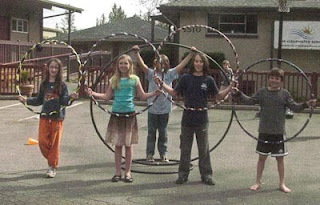 Jacy, Maddy and Keenan are the 1, 2, 3's, who will be performing their latest choreographed spinning routine, Spintastics. I sat in and videoed some of their latest choreography. As I watched, I was struck by the deep friendship between these three that enables them to work together with ease, honesty and mutual support when creating their spinning choreography. They have been friends for many years and the trust and respect between them is evident. This mutual trust and their affection for each other is a product of years spent figuring each other out, working hard to understand complicated, difficult feelings, learning to appreciate each others quirks and strengths, and their commitment to honesty. When they work together on a project such as their upcoming Whistlepig performance, they know each other so well that they can jump right in, communicate clearly without worrying about stepping on each other's toes or feelings, and collaboratively create something they love with efficiency and skill. Most schools are not equipped to provide uninterrupted time, space and an atmosphere of mutual trust and respect for children to explore and develop honest, rich relationships with each other. 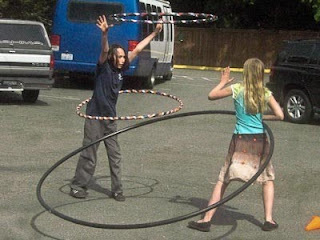 Fortunately, at Clearwater, students can devote the fullness of their energy, creativity and time over days, months and years (not just at recess or breaks between classes) to developing relationship skills that will serve them well throughout their lives. 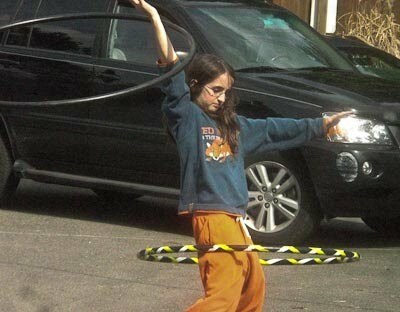 Another amazing performance at Whistlepig will be the Wiggling Monkeys, Clearwater's choreographed hula hooping group. They have been spinning hoops together for several years now, and enjoy the opportunity to create something that is exciting for them and their audiences. This year will be no exception. Finally, here are full Whistlepig details. We'd love to see you, your family and friends. 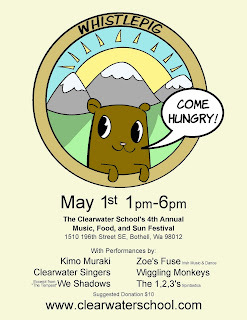 If you can't come, consider making a tax deductible donation via Clearwater's home page. Come hungry! The menu will feature sandwiches made with pulled pork smoked on site and prepared by Clearwater’s Master Chef students; fresh green salad; vegetarian entrées and sides; snacks and beverages. Then, indulge in homemade scrumptious pastries and yummy desserts made by the amazing bakers in our community.